Two D:SIDER 10 satellites and a D:SUB 15. For those who like their bass dynamic but deep, and higher power on the more aggressive sounds. It’s easy to combine the elements of the VERSE D:SIDER series with the SUBs to obtain the best system for your needs. Each element is fitted with a dedicated amplifier and a multi-way system which is assembled using a simple link connection. The Powercon connectors make the system very practical and, thanks to the link on each enclosure, avoid the problem of having to run a power feed to each component. Subwoofers are fitted with a double output link to simplify the left and right audio channels. Thanks to the set of on-board DSP controls, each system can be customized when elements are added or removed, obtaining the sound required for every use. VERSE D:SIDER systems are based on a concept that partially differs from other set-ups usually found today. Each model, right from the smallest, is built to operate on its own with a exceptional power reserve. Each unit in the system is fitted with a dedicated, high-power amplifier - this results a system with the best weight/price/performance/easy installation ratio. 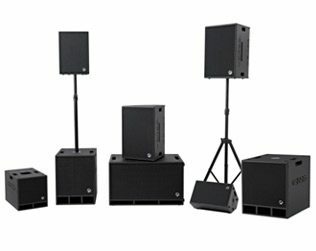 When you need a larger rig, all you need to do is expand your set-up with a subwoofer or another pair of satellites. All setups are extremely user-friendly, thanks to the Powercon connectors and link facilities. This is why we describe VERSE Systems as being “open systems”, as they can grow and follow you and your system requirements through time. 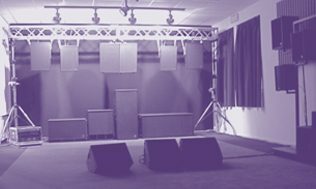 It’s easy to combine elements of the VERSE D: SIDER series and INSIDER MKII –to come up with the perfect sound system solution designed for your particular needs. Verse speakers were designed with the idea that speech and music satisfy us when they are intelligible and pleasant. Systems are not suited to one musical genre or another; they’re just illusions caused by our personal taste. A real sound system must be suitable for listening to music whether we’re in a lounge bar , or in a classical theatre. To achieve this, the VERSE sound usesthe latest construction technologies and DSP processing. The Verse D: SIDER system provides a great dynamic reserve, which can be heard at just the appropriate time. • a very natural equalization response, to satisfy personal taste, thanks to the great dynamism and ability of our new transducers.